Investopedia has a great article outlining 9 tricks a trader can use to improve their trading. "In this article we'll look at nine steps a novice trader can use to perfect his or her craft, and for the experts out there, you might just find some tips that will help you make smarter, more profitable trades, too." This article talks about risk to reward and how to identify targets. "It's not uncommon to hear traders talk about risk/reward ratios in their trading. They'll say things like "I look for 3:1 trades" or something to that effect, meaning they want to take trades where the upside is at least three times as large as the downside. It's one of those metrics that combines with things like win rate to develop a view on the effectiveness of a trading approach." "In this report, I'm going to test the indicator in its simplest form and look at how its performance has evolved over time (and why trading it as a static strategy might be a dangerous approach)." In this video, Adam from Ino.com talks about pullbacks and the Rule of 50. "I can honestly say that 30 years ago I learned how to trade the markets in the pits of Chicago. It was there, in one of those sweaty, tumultuous, in your face trading pits, that I learned one of the most valuable trading secrets in the world. This one trading secret opened my eyes to why things happen in the markets. This trading secret, which is over 800 years old, is one of the most monumental mathematical discoveries of all time. Added: I don't know if anyone is interested in this but the website company I use is now running a 2 for 1 Christmas special. Buy one website package and you get a second one for free. Now there is a unique gift idea! How do you get into a stock before the crowd does? Move down into lower time frames! You can often times spot bullish price action in these lower time frames before it becomes apparent on the daily chart. This is a daily chart of NTAP. 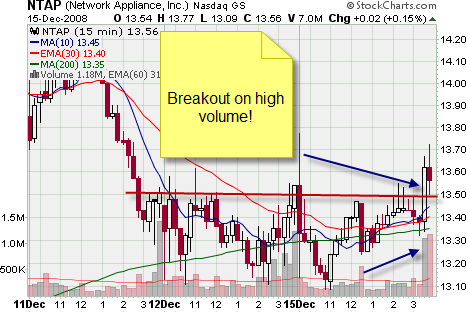 This stock bottomed out and broke out through resistance at $13. 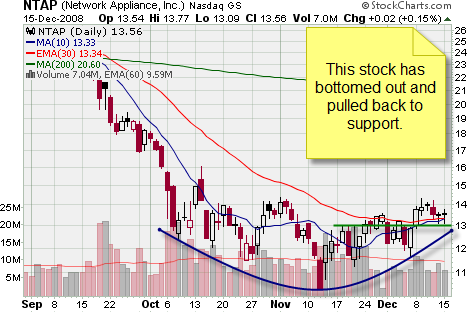 It then pulled back to support. Looking at the daily chart, you can see a couple of doji-like narrow range candles. But this really doesn't tell us much. Momentum to the downside has slowed down which is good but we need more information. We need to find out what is going on inside of those candles. Ok, now we can get a little bit better of an idea of what is going on. 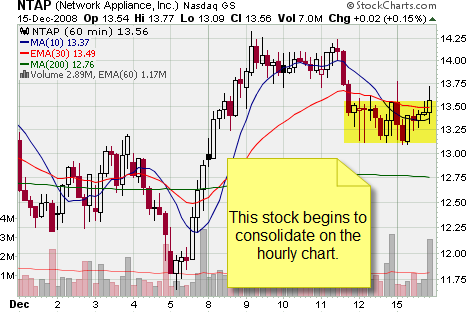 This stock has recently broken down and is now consolidating on the hourly chart. That's great. The momentum to the downside has slowed once again but which way will it break? Will it break to the upside or the downside? Once again, we need more information. 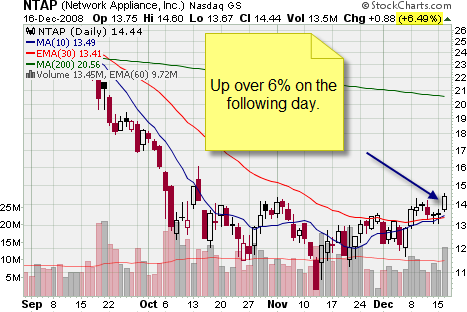 The stock has bottomed and finally, near the end of the day, there is breakout on high volume. The 15 minute time frame is a great to use sometimes when you want to smooth out the erratic nature of the common 5 minute time frame. You can buy the stock here and put your stop under the base. Had you not moved down into the lower time frames, you may not have realized by looking at the daily chart that there was so much bullish price action going on. But, by analyzing these lower time frames you could have established your position a day earlier than the crowd. Then, you can trail your stops off the daily chart or the hourly chart depending on how aggressive you want to be with locking in gains. I generally find that my best trades occur when I develop my ideas at a longer time frame and then execute them on a shorter time frame. The big picture provides the idea, but it pays to wait for the short-term action to get you into the trade--and then keep you there." For swing traders, the daily chart provides the "idea" but the actual execution can be much better if it is based off the short term price action of the intraday charts. And it works. I also find that my best trades are when the lower time frames (intraday) are in line with my expectations on the higher time frame (daily). Analyzing these multiple time frames takes more work but you can get often times get in before the crowd which will lead to better entries.